Serotonin offers an escape from your busy and stressful lives. They have a holistic approach, providing a nourishing eatery which focuses on a plant-based diet with an Exercise Centre. Founder Emily Hazell was on the search for a café with a simple menu, where every dish was nourishing. When she couldn’t find one, she decided to start her own. For more information on the café, head to their website. Serotonin aims to be ethical and scientific. All their food is house-made and every meal is served with a rainbow of colour, filled with all the nutrients your body needs. They use organic, locally sourced products and fair trade ingredients. I went to Serotonin on a Thursday morning with my friend Emily. We were both excited to try this café out. After hearing good things, we wanted to see it for ourselves. 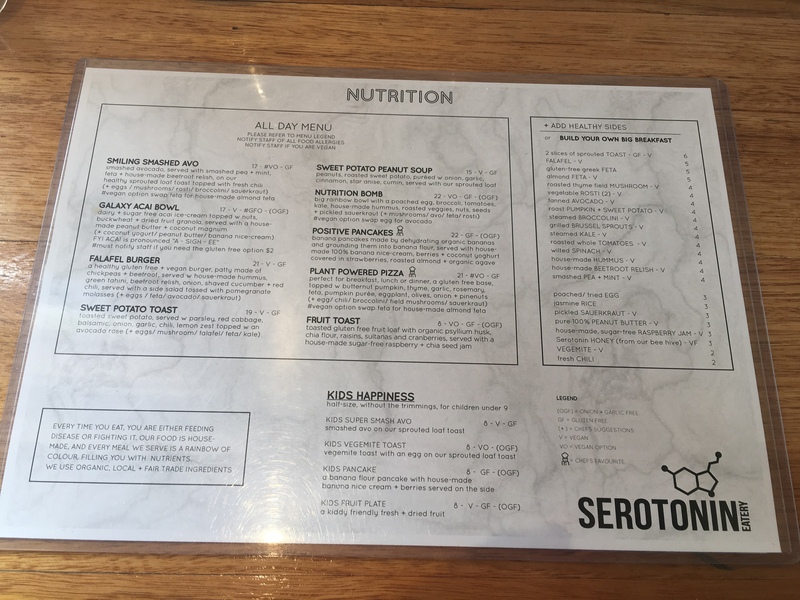 The food menu at Serotonin is quite small. They have only a handful of options to choose from, including a small kids menu. However, their drinks menu is massive! They have a number of fantastic options to choose from, such as juices, smoothies, teas, and specialty lattes. The café is currently using the Five Senses Dark Horse blend of coffee. 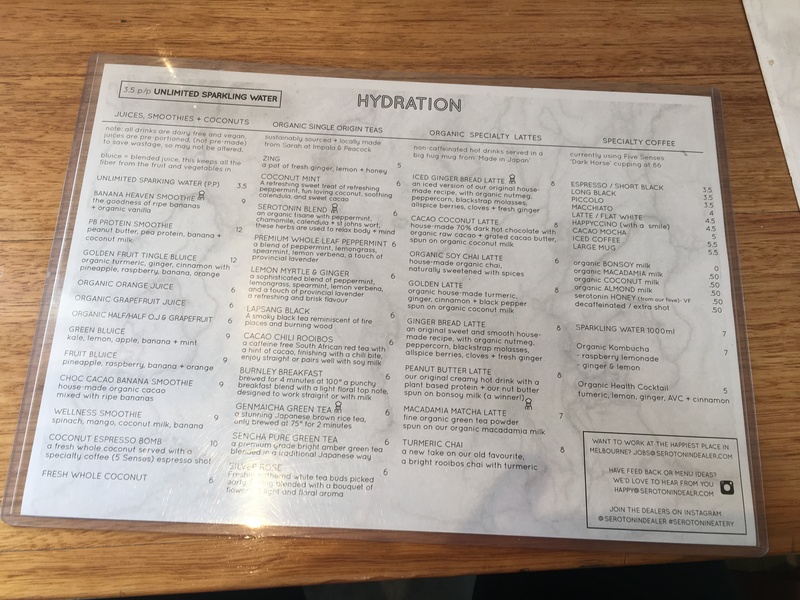 The following menu photos were taken in October 2017 and might have changed since. I ordered the Peanut Butter Latte, a creamy hot drink with a plant-based protein, and a nut butter spun on Bonsoy milk. I also added a shot of coffee. It was delicious and quite different. I had never heard of a peanut butter latte before and, as I’m a huge peanut butter fan, I knew that this was the drink for me. The flavour was interesting and the peanut butter wasn’t overpowering. It had a rich and creamy consistency and every sip was smooth and silky. I would definitely order this drink again. Emily ordered the Cacao Coconut Latte, a house-made 70% dark hot chocolate, with organic raw cacao, and grated cacao butter spun on organic coconut milk. She also added a shot of coffee. She thought it was delicious and loved the flavour combination of the cacao and the coconut. The shot of coffee made it very similar to a mocha, which she loved. She would definitely order this dish again. We both ordered the Smiling Smashed Avo, served with smashed pea and mint, feta, house-made beetroot relish, on their healthy sprouted loaf toast topped with fresh chilli. We both added a poached egg and Emily added a rosti; this dish is gluten free and has a vegan option. It can be difficult to make smashed avo look good, but we thought the dish was plated quite beautifully. The toast was delicious and we were surprised, as most gluten free breads tend to taste like cardboard. The egg was a bit overcooked for my personal liking. I like the yolk runny, however this was on the firmer side. I enjoyed the beetroot relish, but wished there was more of it. Emily also enjoyed her meal and thought the rosti was quite tasty. But we found that the serving size was very small for the price. I understand this is a healthy café and therefore the portion sizes would be smaller, but I feel the price should also be less. I personally don’t feel that this is worth $20, considering other cafes would give double the amount of avocado for a similar price. The café has a unique design. There are large tables with cushioned seating at the entrance, and a number of tables along the windows. They also have swing seating along another window and in their outside area. You can imagine that these are very popular, especially with the younger generation. The design is sleek and clean, and the café is warm and inviting. The staff members are friendly, welcoming and seat you as soon as they can. The table service was good. We got our drinks and food in a reasonable time. They also have a lovely outside deck area, which would be perfect for those warmer days. You can also have your dog in this area. Finally, they have a few seats outside the front of the café. We enjoyed the swings. They were quite comfortable and different to what we had seen before. The environment is very relaxed. I’m sure it would be the same even during their busy periods. We were lucky that it was relatively quiet when we went, because we got the swing seats and didn’t have to wait long for anything. It is comfortable to sit, chat, and enjoy your surroundings without feeling that you have to move on to make room for others. Have you visited Serotonin before? Tell me what you thought of it. Do you have any suggestions of cafe’s to visit?